This year I decided to ride my bicycle to christmas. The kids were already with their mum down at grandma's house in Roskilde, west of Copenhagen, so I just needed to show up on the 24th, which is christmas in Denmark. Lovely sunshine that day, so I hopped on my Velorbis, wearing my respectable christmas clothes of course, and carrying a bag of presents on the front rack. I had just downloaded the Endomondo app for the smartphone, too. 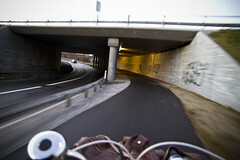 I don't normally have a clue how far I ride around the city - and don't know anyone in Copenhagen who does. I know how long it takes to get to places, not how many kilometres. But this app sounded like fun so I tracked the journey to Roskilde and the journey back again. The Endomondo app has an option for 'Cycling - Transport' which is great, even though they still call everything you do a 'workout'. I figured that riding 30 kilometres and averaging 20 km/h would get me there in about an hour and a half. It takes an hour to get there with bus/train/walk, so 30 minutes extra was no big deal. On the way out, however, there was a pesky headwind of about 9 metres/second so it took a bit longer. Not to mention the hills. But no matter. It was a lovely ride. 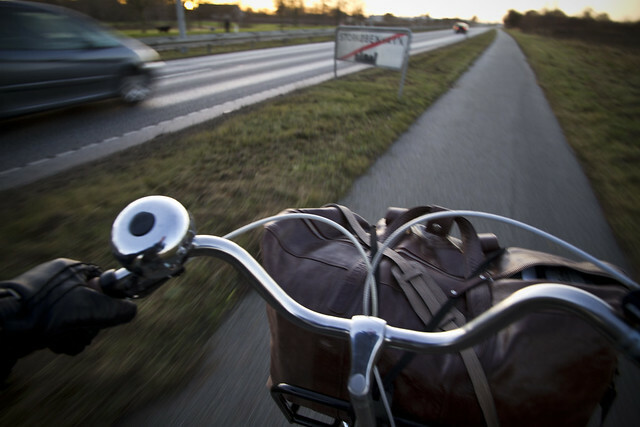 On the way home a tailwind of about 11 metres/second pushed me back to Copenhagen. 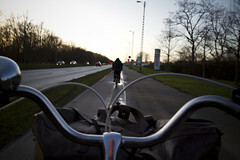 It was nothing special, just a nice bike ride. 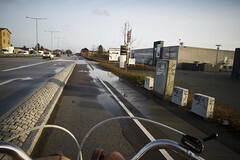 If it had been raining, I would have taken the bike on the train. 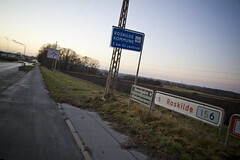 The route is simple from Copenhagen to Roskilde. 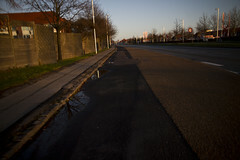 It's an almost completely straight line along Roskildevej. Roskildevej was built between 1770-1776 as a replacement for the old King's Way (Kongevej). Kings had various Kongeveje around the country for their use and then there were other roads for everyone else. Roskilde was an important town and home of the national cathedral where most of our kings and queens are buried so building the road was a given. The prime minister, J.H.E. 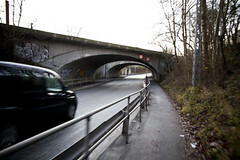 Bernstorff, hired a French road expert in 1764, Jean Rodolphe François Marmillod, to carry out the work on this and other routes including, not surprisingly, Bernstorffvej north of Copenhagen. 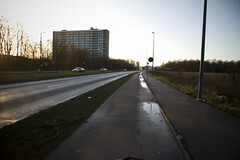 Before the motorways were built, Roskildevej was the main artery leading to Copenhagen from the rest of Denmark. 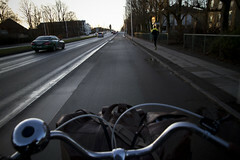 I don't get out of Copenhagen much so it was going to be interesting to see what it was like to ride those 30 km. 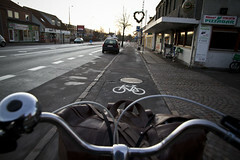 You know, the quality of the bicycle infrastructure, the wayfinding, etc. So I took some photos. At left: About five kilometres into the trip. Protected cycle tracks still under my wheels and they are quite wide. There are about 4000 cyclists a day on this section of the route. At right: Farther out. About 10 km. Wide, protected cycle tracks. I might as well just say now that there were protected cycle tracks on the ENTIRE route. Every single centimetre of it. At left: Nice and wide. At right: Shot backwards. 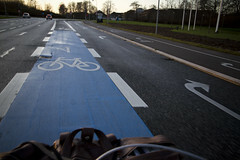 Cycle track and loads of buffer space between the cycle track and the road. 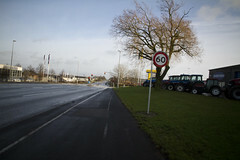 Nice, since the speed limits were between 60 and 80 km/h. At left: It was christmas so there wasn't much traffic. 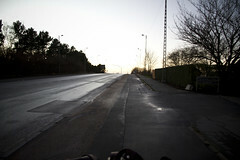 The 23rd of December is the big travel day here so there were few cars and few cyclists. Most people at this time of day - 14:00-16:00 - were already at their destination. 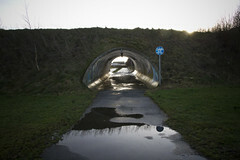 Nevertheless, there were other cyclists on the route, most with bags of presents. At right: Many of the neighourhoods in the suburbs were designed in the 1970s and feature bicycle and pedestrian ways that are completely separated from the roads. We'll be getting out to some of these towns in the spring to show you all what they're like. 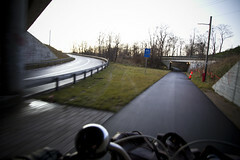 The only time the cycle track deviated in form was leading up to a large roundabout located next to a big box store area featuring IKEA and others. Then the cycle track turned into a right-turn lane and if you are heading straight or left, you moved out into this bicycle lane up to the roundabout. 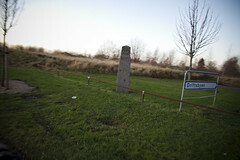 Here's the link to the roundabout on Google Maps. At left: I love the old milestones along the way. 20 km from City Hall Square here. 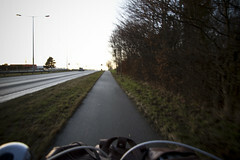 At right: I hit a stretch of bi-directional cycle track just past the 20 km mark. There was still a cycle track on the opposite side of the street, this bi-directional section was pure A to B due to access to this side of the road and various businessess, etc. At left: Every time you hit a town - in this case Hedehusene - the cycle track looks like it does in every city in the country. At right: Here was the narrowest section of cycle track, heading under this old railway bridge. 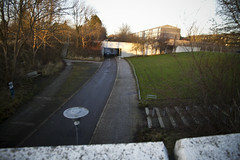 At left and right: The cycle track was much wider under the motorway. 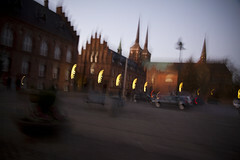 At right: Roskilde Cathedral. One km to go. In the Danish national anthem the praises of our hills and valleys are sung. 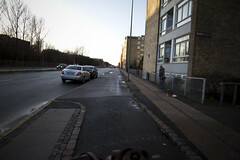 You forget about it in Copenhagen sometimes, but head out of town in any direction and the landscape is rolling. I didn't rise out of the saddle at any point, but the hills surprised me. Long, gradual inclines. You can see the altitudes on the Endomondo links at the top, I think. The plan was to ride home after christmas evening but when I went out to the bike at 01:00, the front tire was punctured. Fixing a flat at 01:00 in the morning after loads of red wine was not a preferred option. So I slept there and left the next day, after fixing the flat. At left: On the way home I saw lots of great things, too. 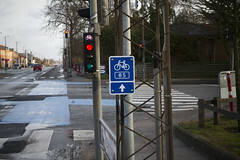 Right turns at red lights allowed for cyclists. 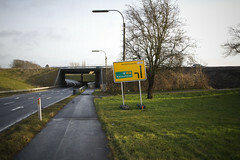 At right: Signage for the route number on the national cycling network. 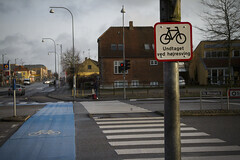 Denmark was the first country in the world to develop a national route system for bicycles, thanks to this man. At left: Confusing road signs for motorists. Me? Just head straight. 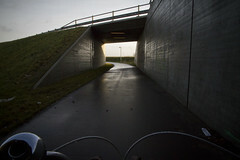 At right: Bicycle and pedestrian tunnel through the earthen sound dykes separating the noisy road from a residential neighbourhood. You can beat this section of the route. 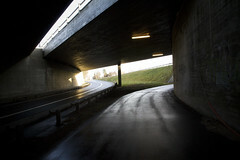 Wide and gorgeous cycle tracks under the motorway. At left: You can ride your bicycle safely to the tractor/farm equipment shop if you like. At right: Or to any of the big box stores along the entire route.